NGO News blog, NewsLine: RCI-SEVAI –CCRS project: Open Shelter celebrates Eco-Friendly Deepavali -2018 in Trichy. 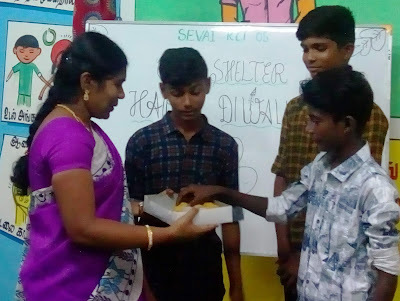 RCI-SEVAI –CCRS project: Open Shelter celebrates Eco-Friendly Deepavali -2018 in Trichy. RCI-SEVAI –CCRS project: Open Shelter celebrated Eco-Friendly Deepavali in Trichy. The Railway Children India project is implemented in Trichy Railway Station. The associated Open Shelter is situated in a spacious space at 400 metres away from Trichy Railway Junction. SEVAI-RCI -Open Shelter of Trichy celebrated Eco- friendly green Deepavali without crackers in Open Shelter. Four children from Pudukottai, one child each from Thanjavur, Kanyakumari and Tirupur District totaling 7 male children resided in Open shelter celebrated Green Deepavali festival season in Open Shelter. Deepavali, the ‘Festival of Lights’ is celebrated throughout India with great passion and cheerfulness and this festival is celebrated by children and old, rich and poor, throughout the country to dispel darkness and light up their lives. The festival symbolizes unity in diversity. The spirit of happiness was inculcated among the minds of the Open Shelter children. Deepavali is all about giving or sharing of sweets and food items, play and receiving good ideas for a happy living with families and main stream population. The Open Shelter provided special festive food and sweets to the inmates of this Open Shelter run by RCI-SEVAI in Trichy. The senior Management of SEVAI, project functionaries of RCI-SEVAI Railway Children CCRS Project and FO of RCI jointed this Deepavali season celebration with Children. The Counselor Sukumaran spoke among the kids “Children should be happy and enjoy the Deepavali. It is high time children must have responsibility as Responsibility can also give moral strength, such as saying no to undesired activities children should realize the importance of the relationship between an individual and the society. Children belong to the society and they need to play a major role in it. Children cannot live separately from the community-life. The Deepavali Celebrated in Open Shelter is Eco-friendly festival and open shelter children should behave an outstanding student once he is reunited with the family and School. Student responsibility is demonstrated when students make choices and take actions which lead them toward their educational goals”.